The bookstore chain sold off on a weak first-quarter earnings report. Investors gave Barnes & Noble Education (NYSE:BNED) an F last month as the college bookstore chain slipped 15% according to data from S&P Global Market Intelligence. 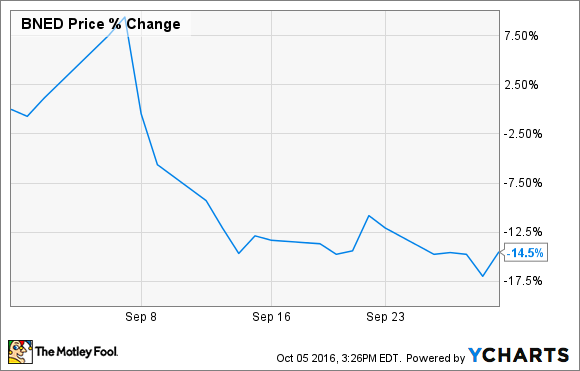 As the chart below shows, the bulk of the loss came on September 8 when the company reported first-quarter earnings. The bookstore chain's stock fell 9% the day its earnings report came out as investors were disappointed with another sizable loss. The stock continued to slide after that, giving up more than 10% over the next three sessions as investors' concerns mounted. Comparable sales fell 2.8% in the quarter, and revenue increased just 0.1% to $239.2 million, but that was well short of estimates at $245.6 million. On the bottom line, the company posted an adjusted loss of $0.56 per share, slightly better than its total a year ago, but that figure benefited from a higher share count. CEO Max Roberts noted that the first quarter is seasonally the slowest for the company since many students are off in the summer months, and he blamed the weak results on lower student participation in summer classes. The company's guidance also left something to be desired, as it sees comparable sales for the fiscal year in the range of flat to down 2% with overall revenue up 2-4%. On a positive note, B&N Education opened 33 new stores in the quarter just in time for the start of the school year, bringing the total store count to 770. It expects those stores to contribute $110 million in annual revenue. When B&N Education separated from its former parent Barnes & Noble last year, some thought the company to be the stronger of the two, but the stock has underperformed by more than 35% since the spinoff. There's little in this report to suggest that things will change.